While Feedly may have a bit of a monopoly over news reading apps, that doesn’t mean there aren’t underdogs out there. 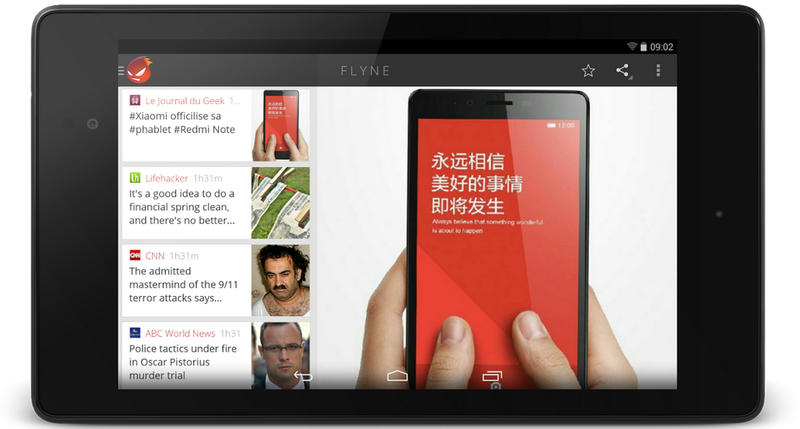 Flyne was announced as a bit of a different take on the classic reader, as it pulls content from Twitter rather than the traditional RSS syndication. Selecting topics of interest pulls Tweets from Twitter accounts known for expertise in the area, and presents those articles in an easy-to-read manner. Its latest update brings a bevy of enhancements, including smoother transitions and animations and an overall polished look. Users can now double tap to close articles and mark said articles as read while scrolling. There is also a new list-based navigation setting which can be toggled in the display settings menu, and a refreshed layout for tablets. Apart from that, the rest of the update is made up of basic UI improvements such as a new transition animation and faster article preloading. The app remains free on Google Play, but beware the in-app purchases if you want to add Feedly integration, a Twitter account, or the ability to download your feeds as offline magazines.